In the spring of 1999, my mother took me on a weekend to Paris to visit a dear friend of hers. I was only thirteen at that time and though most of that stay is a blur, one of the things I do remember is the conversation he and my mother held about the Trans-Siberian. I did not know a thing about Russia at that time, let alone what traveling across it actually involved. All I can recall is how our friend's eyes sparked when he talked about his time on the train and simultaneously, generating the kind of perfect smile on my face. Then, as he noticed me trying to snuck into the discussion, completely intrigued, he took a good look at me and said: "Dear, this is a journey you have to take one day. You are the type." Little did I know that this heart-to-heart would impact my life... permanently. It could have been an idea, it could have been just a suggestion; but it was impossible to put to rest. Not at thirteen, and surely not at any given time in the years that followed. His words echoed in my heart like the cry of a wolf lingers on a night of full moon. 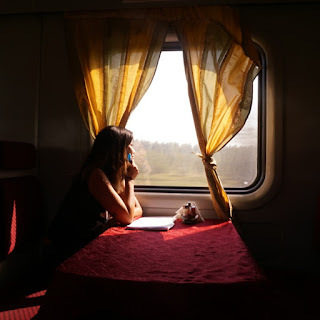 And the more I learned about the world -- the more I saw of the world; the more I was assured that the Trans-Siberian was the type of journey for me. The only question was not if -- but when I could pull it off. The Trans-Siberian, though at the top of my list, was nevertheless stuck on hold. Truth be told, I believe that I intentionally visited other places first because with time, it had morphed into a monster of a dream that I preferred to look forward to than an actual plan that had to be realized. A part of me always thought of it as my Everest in terms of travels -- and there was something comforting about making it a highlight that was not one just yet. In fairness, there were a few attempts in the past: the last one was in 2010 when my father and I were just a click away from booking tickets. However, the trip had to be cancelled due to unfortunate circumstances. I was disappointed of course; but not entirely crushed. The eerie feeling that it was not the best time quite yet persisted. Looking back, I am relieved that my previous efforts failed because there could not have been a better year than 2015. On the eve of my 30th birthday, I figured -- or I recognized -- that the time to embark on this long-awaited journey was now at last. Not only on a purely logistics basis, not only because I found the ideal traveling partners to share the adventure with; but as trite as this might sound, I was ready. Dare I say that everything fell into place this year, and I could not have been any more ready. Currently at the biggest crossroad of my life, I am bidding farewell to a 10-year roller-coaster ride and just about to get on board a new one. In every respect, my present entails being suspended between the past and the future; so the Trans-Siberian would be the epitome of this transition. And rightfully so, because that is what the Trans-Siberian is, a journey of transition. There are different routes. The main thing to keep in mind is that whichever one you choose, you will travel across two continents, covering some of the largest lands -- and definitely some of the greatest civilizations -- that the world has ever known. It is plausible to remain in Russia alone if you take the route to Vladivostok; but ultimately, we wished to include Russia, Mongolia and China in our itinerary. Nearly 10,000 km by train -- if one has a difficult time to imagine how much or how long that takes, just consider that from Moscow to Irkutsk, one spends more than three full days in the train, which is what we did. There is not a single trip I took in the past where getting there was of any importance. For obvious reasons, the only thing that mattered when I traveled was to arrive at the destination. Sure, the trip can be fun; you catch up on some reading or watch the movie that you missed at the cinemas, the sceneries can even be majestic; but most times, no matter which vehicle, whether the train, the bus, the car or the plane; it was, in the end, just the means of transportation. The means to the destination. But everything is reversed when you decide to go on the Trans-Siberian. The real tour is getting there. Once people realized how long we were on the train, they asked the same question: "What did you do to kill time?" And it is at that moment that I comprehended why our friend from Paris gushed the way he did. I had to experience it for myself. I, now, also knew and loved the answer: the Trans-Siberian allows one to appreciate time fully, not kill it. Life on the train creates a world of its own: by crossing over to Asia you get to travel through five time-zones in flesh. The most fascinating thing for me was that the clock on the train -- and in the subsequent railway stations -- always kept Moscow time though we were already in the middle of Siberia or on the other side of it. In a nutshell, I never knew what time it was... and that was also the point, it did not matter. We were free. I was as much in touch with the world as I was detached from it in the Trans-Siberian. It was an escape as much as it was home. As rustic as the atmosphere was, the train became everything we needed: our bedroom, our gym, our restaurant, our classroom, our play center, our library, our bar, our living room, and so on and so forth. Besides, the incredible strangers we met promptly became our family: we were from such different paths, but we all shared the same journey. The train, then, had its own tempo: neither slow nor fast -- it was just real. I learned to seize it; and every time I would glance outside the window, it was a startling sensation to always be somewhere but never anywhere concise. The only thing certain was that we were headed East, simply following the sun. And so once we stopped, the wondrous places we visited crowned the whole adventure. From Europe to Asia, we were handed a bouquet of contrasts. From trying to learn the Cyrillic alphabet to deciphering the countless Chinese characters, from being in awe facing Moscow's magnificent Red Square to exploring the gargantuan Forbidden City of Beijing, from being unique in the middle of nowhere in Irkutsk to feeling squeezed among a billion in the overcrowded streets of Shanghai, from indulging in Russian fine cuisine to tasting lamb in all its forms in Mongolia, from swimming in the Lake Baikal in Siberia to getting engulfed in the beautiful Mongolian steppes, from climbing the one and only Great Wall to enjoying a cosmopolitan in one of Shanghai's best rooftop skyscraper bars, from studying Lenin, Genghis Khan and the Ming Dynasty to devoting a moment to God in orthodox churches and Buddhist temples, from riding horses outside UlaanBaatar to standing on the glass floor on top of the Oriental Pearl Tower in Shanghai... More than anything, the palette of places, peoples and experiences was really as diverse as it can get, and the blend of colors I draw from the trip will be , without a hint of a doubt, one of my most proud accomplishments. Traveling, aside from writing, has always been a most deep-rooted desire, priority and passion. In fact, both have a tremendous amount in common: I fill a blank page like traveling fills my life. I step outside the box as much as delve into my soul to bathe in the magic of it all. And I have never written as passionately or explored as extensively than during the Trans-Siberian. The longer we were on the road, the more I embraced the trajectory -- physically and metaphorically. In the end, it was an outward journey as much as an inward one. I will forevermore be grateful to have ventured in the Trans-Siberian. I am blessed to be able to put my own impressions on paper. Finally, with the memory of it still burning in my heart, I can apply the greatest lesson I picked up along the way to my own life. At the end of 2015, I am indeed leaving a part of me behind and ready to forge a new one -- and I am aware that my transition is as important -- if not more important, more momentous, more riveting -- than the destination, like the Trans-Siberian. For wherever the train of life takes me, from now on, I will always, always appreciate the time on the journey. My journey.